You can set custom priority to interactions in the queue based on specific conditions. You can specify conditions which when met by an interaction can take a higher or a lower priority than the default priority set for the interactions within the queue. To use the Interactions feature, you must be using the local CRM.If you are using the local CRM, use the Phone Queue, Interactions tab to customize how the selected queue prioritizes specific types of interactions based on the local CRM data. For example, AcmeJets has a support chat queue whose default priority is set to 6. This queue handles support enquiries from all customers. To better serve its premium customers before others, AcmeJets can define a higher interaction priority for interactions from its premium customers by setting a condition to determine the customer type. When an interaction meets the condition, the default interaction priority overrides the default priority of the queue thus allowing agents to serve the premium customers faster. Set a value for Default Interaction Priority within the Queue. Define an interaction rule to specify a matching condition. Select a CRM field from the list and specify a value. Set a value for interaction priority for calls matching the rule. Check Enable Priority Routing Rule option to activate the rule. Add one or more rules. Table 32 summarizes the options available in the Phone Queue page, Interactions tab. To customize the priority for specific types of interactions within this queue, choose a non-default priority level, then in the condition area, specify the conditions that will receive the non-default priority. In the list, 1 equals lowest default interaction priority, 100 equals highest interaction priority. Click on the respective icons to create modify, or remove an interaction priority rule. Choose a local CRM field definition. Your choice enables the options available in the equals list, described in the next table row. For more information about CRM fields, see CRM Custom Fields, on page 1. Choose a field value from the list. The choice in the if the value of the field list , described in the preceding table row, determines the choices available in the equals list. For example, if Customer Type equals Platinum then set interaction priority to 90. Choose the interaction priority applied when the conditions specified in the if the value of the field list and equals lists is true. 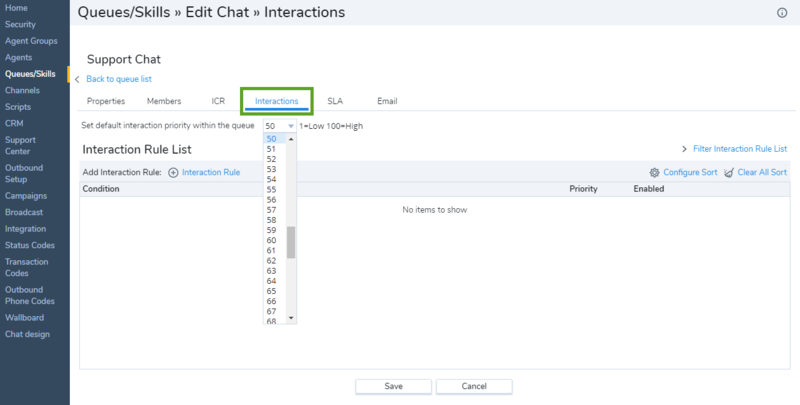 Select to enable Virtual Contact Center the rule.